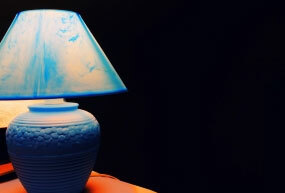 Lamps come in all shapes and sizes: tall, short, long, fat, skinny, heavy, light, ceramic, plastic, wooden, metallic. Unfortunately, they are all a complete annoyance to pack. Nearly every variety of lamp, when moving day comes, provides some obstacle to your continued sanity. If there is a problem packing a lamp, however, there is a solution for de-stressing the packing process. First, remove the lampshade, the most delicate part of any lamp. Pack it like you would any delicate item: wrap it generously with newspaper or packing paper. If you have multiple lampshades, nest them together. If you are packing a tall lamp, it likely has a stand you can unscrew or otherwise disassemble. Wrap it with insulation as well. Smaller lamps must be insulated and packed carefully, in a moving box of its own if possible. These delicate items must be packed with the utmost care. Whatever the size of the lamp, it must be packed and labeled carefully. Make sure it is marked “fragile and stored upright. Place all boxes containing lamps and lampshades toward the top of your moving truck. While packing a lamp is a pain in the neck, you can move it into your new place easily if you pack it with care and store it in your moving truck properly.